Like canyon mock-orange, Texas mock-orange makes its home in a very limited area of limestone rocks and boulders on the Edwards Plateau where it is endemic. It is a diffusely branched shrub with peeling bark and bearing small ovate, somewhat fuzzy, dark green and glossy leaves having three prominent longitudinal veins. Its solitary or sometimes clustered white flowers are more prolific than those of P. ernestii. 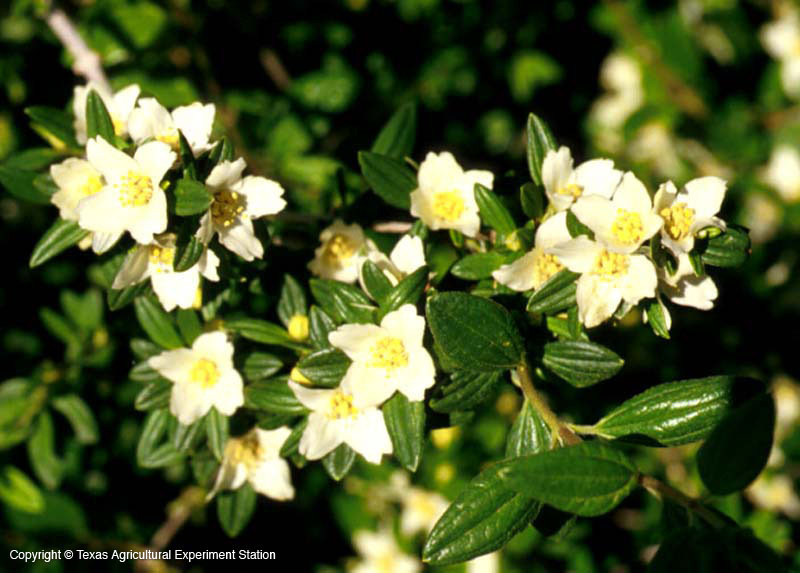 It has been observed that Texas mock-orange adapts to the heavier soils in the Dallas area, and initially requires quite a bit of water to establish in a garden. It tolerates and responds well to shearing , and is a desireable border plant. It is browsed by deer. P. texensis has been designated TOES V, which means that it is on the Texas Organization of Endangered Species Watch list as a species without legal protection, and has either low populatiion numbers or a restricted range in Texas. That is, it is neither declining nor having its range restricted, but rather needs some attention to make sure that it does not become threatened or endangered.